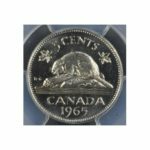 Coin collecting has rarely been more extravagant than it will be on Oct. 3 and 4 during the Toronto Coin Expo Fall Sale, taking place at the Toronto Reference Library and online at iCollector.com. This numismatic auction will feature some of the rarest and most expensive coins and paper money on the market, with items that are a must-see for anyone with a deep appreciation of finance and history. The "King of Canadian Coins"
In Canada, like in America, the 50-cent piece has always had a hard time catching on. 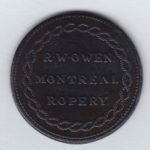 The Canadian version began being minted in 1908, and had a rocky time gaining wide usage, culminating in it almost being taken out of circulation in the 1920s. It got to the point that only 28,000 total pieces were minted between 1921 and 1929. Then, in 1929, greater demand began to arise for the 50-cent piece, and in response the Master of the Ottawa Mint decided to melt the stock of 1920 and 1921 coins, which amounted to roughly 480,000 pieces, to use as material for new production. The decision was apparently made out of fear that people would suspect counterfeiting was responsible for such a large influx of coins dated from a decade previous. As a result, it is believed there are only about 75 1921 50-cent coins remaining in the world, which accounts for its ability to fetch a price of anywhere from $45,000 to $400,000 at auction, and its nickname as the "King of Canadian Coins." Now, with the Toronto Coin Expo auction, collectors will have the chance to add one of those magnificent and rare pieces to their portfolio (lot #416). It's an opportunity that doesn't come along very often. Another Canadian rarity that will be available at the October auction is the 1954 Bank of Canada $2 Devil's Face bill (lot #706). So-named because a printing error (or was it intentional?) led to the appearance of an image resembling a devil's face in the hair of Queen Elizabeth II, whose visage adorns the bill, the bill has taken on mythic proportions in the world of bill collecting. 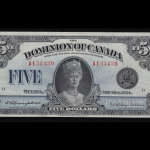 The notoriety of the devil's face, or devil's head, tangled in the Queen's hair led to the Canadian mint ordering a new set of the bills with darkened highlights in 1956, making examples of the original such rare and valuable commodities. 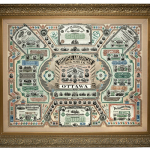 One of the notable aspects of most any auction of Canadian money is the fact that there are often so many pieces dating back to the 19th and early-20th centuries. The Toronto Expo auction is no different. Part of the reason for that has to be the often extraordinary beauty of that country's coins and paper money. 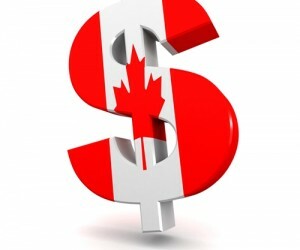 Unlike the bland bills of its southern neighbor, Canada's money uses deep, rich hues and relatively fanciful colors that make them valuable on their own as pieces of artwork. Numismatic auctions have never been as accessible as they are on iCollector.com, where serious coin and bill collectors come to shop. Most significant coin sale in 40 years exclusively on iCollector.com, bid on your mobile device today!